Joseph Spine is pleased to announce Dr. Ron Chatterjee has joined our practice in all locations, including our new location in Brandon Florida that will focus on Interventional Pain Management. Dr. Chatterjee specializes in diagnosing and treating acute and chronic pain syndromes through a variety of techniques. His goal is to quickly relieve pain and restore function to his patients. From the training he received, his focus is on pain originating from the spine and affecting any part of the body, although he has a strong ability to assess all types of pain and distinguishing its source. Dr. Chatterjee also has expertise in the management of sports-related injuries and has been the team physicians for high school football and independent professional baseball teams, along with working with the Tampa Bay Buccaneers. His education in physical medicine and rehabilitation has allowed him to help patients successfully improve their quality of life and be as independent as possible through multiple modalities. Dr. Chatterjee is a physician that will always spend extra time with patients making sure their problems are addressed and ensuring they receive the best care available. He is up-to-date with all current treatments including regenerative and stem cell treatments. Dr. Chatterjee is not only interested in improving your current pain and disability, but also your long-term health through a comprehensive, multidisciplinary and holistic approach. Dr. Ron Chatterjee was accepted into the highly sought-after and competitive BS/MD program right after high school. He received his Bachelor’s of Science Degree at Kent State University. Dr. Chatterjee studied abroad at Leicester University in Leicester, England after leaving Kent State and before his medical doctorate program began. He then proceeded to Northeastern Ohio Universities College of Medicine (now called Northeast Ohio Medical University) where he completed his medical degree.Dr. Chatterjee went on to a transitional year internship at St. Elizabeth’s Hospital in Youngstown, Ohio. Dr. Chatterjee completed his residency in Physical Medicine and Rehabilitation at UT Southwestern Medical Center in Dallas, Texas. Dr. Chatterjee was fellowship trained in Interventional Spine and Sports Medicine at Ahwatukee Sports and Spine in Phoenix, Arizona. Joseph Spine has four locations in Tampa Bay, including Tampa, St. Petersburg, Safety Harbor, and Brandon, FL. Join, us, Team Joseph Spine, as we walk and fundraise for this year’s Walk For Wishes at Water Works Park in Tampa on Saturday, April 28, 2018. Together, we can raise money for Make-A-Wish to help grant the wishes of children with critical illnesses. Walk For Wishes is a nationwide Make-A-Wish® fundraiser that celebrates the more than 285,000 wishes that have already been granted, while raising funds for future wishes. It’s a family-friendly event powered by wish families, volunteers, donors and friends. You can participate by registering to walk or or you can donate to a walker or a team. Below is some general information about the walk. You can also visit Make-A-Wish’s sub site Walk for Wishes for more information. T-Shirt information: All registered participants receive an official Walk For Wishes t-shirt. Deadline to register to receive a t-shirt is April 15, 2018. Last year, Make-A-Wish granted more than 15,000 wishes nationwide – that’s one every 34 minutes. Make-A-Wish is dedicated to making every eligible child’s wish come true and they need all of the community support we can offer– fundraise with us today and you can be a big part of making that happen. 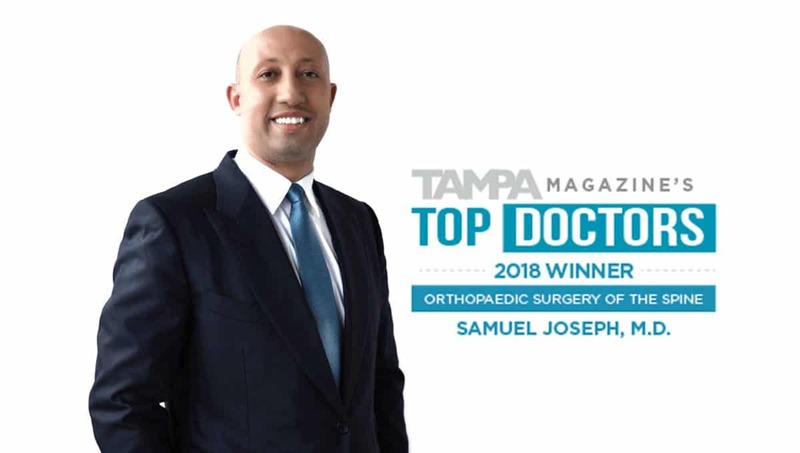 Tampa, FL November 9, 2017 – Dr. Samuel Joseph, founder of Joseph Spine, will be one of a select group of spine surgeons globally that now offers minimally invasive spine surgery through the Mazor X Robotics Guidance System. This next generation, revolutionary technology enables Dr. Joseph to perform safer and more accurate spine surgeries. For our patients, this means better clinical outcomes with less pain and fewer complications, enabling a faster recovery and return to daily activities. Surgical treatment of the spine requires planning and precision, and each patient’s anatomy has unique challenges. Surgery with Mazor X Robotics’ guidance system enables Dr. Joseph to plan ahead before entering the operating room. During surgery, it guides him according to the preoperative plan that was created. Dr. Joseph will use this advanced 3D planning software before surgery to create a unique surgical blueprint, which is the ideal surgery for each patient’s condition. During surgery, Dr. Joseph does the actual work; the Mazor X Robotics systems guides his tools according to the surgical blueprint to place the implants safely, and with the highest level of accuracy in the exact preplanned locations. And since there is no need for additional X-rays during surgery, there is less exposure to radiation than with other surgical treatments. How safe is this technology? The Mazor X Robotics Guidance System is powered by Mazor X Robotics clinically proven technology — used in thousands of surgeries worldwide, including placement of tens of thousands of implants. Like all Mazor X Robotics systems, it strictly adheres to international standards and has received FDA clearance in the USA and the European CE Mark.